It’s been almost 12 months since we came out with our original guide for convertible car seats. As road trip season gets underway, take a look at our updated candidates, which include new seats from Graco, Recaro, Maxi Cosi, and Clek. We’ve also added a section that highlights the best convertible seats for newborns. A convertible car seat will help protect your child when facing forward or backward and will become a permanent fixture in your car. If I were buying one today, I’d get the Chicco Nextfit 65 due to its easy installation and extended rear-facing capability. We considered 19 different seats over the course of our 38 hours of research and testing. We consulted with child passenger safety technicians and car seat bloggers, and we combed through reviews while conducting our own real-world testing to determine our pick. Many parents who spend most of their transit time in a car will probably end up buying a bucket-style infant car seat to start with. If you’re looking for more information on infant seats, we have a guide for that as well. These tend to fit infants up until 12 months (but sometimes just until six or nine months). This is because they have specific height and weight limits. Most infant car seats have a height capacity between 29 and 35 inches and a weight capacity between 22 to 40 pounds. It’s important to note that most babies will hit the height limit before the weight limit; a 40-pound child could be two years old and much too tall for an infant car seat. Once tots outgrown these seats, they’re ready to graduate to convertible car seats. Some parents don’t realize, though, that you might even be able to bring your newborn baby home from the hospital in a convertible car seat, so long as it fits a baby that small and is installed rear-facing at the proper angle. Many models we tested are capable of fitting babies as small as five pounds, and some even include a special, removable insert for them. How do you know if you want a convertible seat from day one or an infant seat? The key difference is portability. An infant seat pops in and out of a base secured in the back seat of your vehicle. The baby is strapped into the seat before being transported to and from the car; in essence, the infant seat doubles as a baby carrier. A convertible seat, on the other hand, is attached directly to the car and baby must be unbuckled from the seat and lifted out. Parents who don’t spend much time in the car or who don’t need the snap-and-go capability may find a convertible car seat to be a more cost-effective option than buying several extra bases. Convertible seats are also a reasonable option for the caregiver who’s not the primary baby chauffeur. For some context, a standard Chicco Keyfit 30 infant car seat will set you back $200. When your baby outgrows the infant seat, they’re also leaving behind the extra base. You’d be investing $285 into something that will last about a year. Parents for whom cost is a bigger factor than convenience may want to skip the infant seat and start off with a convertible seat, which will last several years, growing with your child from newborn to toddler. Besides value, the push toward convertible seats first is gaining traction thanks to Consumer Reports. Their crash testing found that “53 percent of infant seats demonstrated head contact with the simulated front seatback, 96 percent of rear-facing convertibles prevented it.” What does this really mean? In many cases, the taller seat back of a convertible seat did a better job of protecting a 22-pound test dummy’s head, and that there was less potential for injury as compared to an infant seat. Does this mean that you should throw out your infant car seat right now? Not necessarily, but many parents are now choosing to buy a convertible seat sooner, be it for a newborn, or at 6 months. What makes a good convertible car seat? The first child car seats were designed to prevent a child from roaming around the car freely, while still allowing the parent driving to keep an eye on the little guy. Since that time, we’ve learned a lot more about child safety best practices. When you’re buying or researching car seats, you’ll hear that the best car seat is one that fits your child and can be safely installed in your vehicle every time. It’s a fact that three out of four car seats are installed incorrectly, so you’ll want to make sure that you fully understand the instructions on the seat that you end up with. If you’re unsure or if you need some help with your seat, you can visit Safekids.org to find a Child Passenger Safety Technician in your area to assist you. A good convertible car seat should allow maximum seating room for your baby while being compact enough to fit (forward and backward) in your backseat. Many times, passengers in the front seats will have to move their seats up in order to accommodate a rear-facing seat. Don’t think that because you drive a giant SUV or minivan you’re immune to this concern. Another NightLight writer’s personal experience was that her convertible seats were a tight fit—even in a Nissan Pathfinder. Lastly, you’ll want to read through a seat’s height and weight capacity as well as its minimum allowed age and size. If you have your baby with you, it’s a good idea to place them in the seat to see how the harness works. Many new seats will have “no-rethread” harnesses—yup, that’s the official name—as well as crotch buckles or straps that are equipped to stay out of the way when you put your child in them. These features can make securing your child much easier. You’ll want to avoid seats with heavy fabrics that get hot quickly or ones that are too bulky for your vehicle. In addition, before buying a seat, check and double-check that there are no current recalls or safety issues on the model that you’re interested in buying. Our pick, as well as the rest of the seats on this list are all current models with no recalls, known issues, or safety bulletins. Beyond that, no-rethread harnesses, lock-offs (locking clasps on the seat designed to secure the seat belt in a seat belt installation), and better materials become the norm. This includes better fabrics that won’t get as hot as the thick, velour-style fabrics on budget seats, more cushion to keep your baby comfy, and more rigid structures. Seats we tested that had exposed plastic shells tended to be more difficult to install and flexed a lot when we tried to tighten them, making installation much more time consuming. The more rigid seats, like the Chicco and the Clek, weighed themselves down and took much less time to tighten in every vehicle we tried. Cup holders are a toss-up: They invite a mess into your back seat but could prove useful for older kids on longer commutes. Once you exceed the $300 threshold, you’re buying into extras like premium exterior fabrics that will look and feel nice but not actually affect the seat’s performance in a crash. Another thing to look for are so-called 3-in-1 style seats. These seats promise seating options for infants, toddlers, and even preschoolers. In our research, we found that those seats tended to skimp in certain areas. They would fit an infant well but not accommodate larger toddlers, or be awkward for infants while functioning well as booster seats for older children. In trying to be everything to everyone, they mostly wound up being mediocre all around. It’s important to note that every seat that is available to purchase in the United States has to pass the same safety testing, regardless of price. It’s rather difficult as a consumer to qualify one seat as the safest, however newly proposed safety testing would better inform prospective buyers. With that said, manufacturers are adding new technology and improving their seats to be even safer and easier to use. Companies like Clek have even put their testing data online for consumers to review and analyze. Car manufacturers were required to include LATCH connectors on all passenger vehicles starting in September of 2002. Note that manufacturers are not required to put lower anchors in every seating position, so most skip installing them in the center seat. You’ll find where they’re located in your vehicle by reading your owner’s manual, feeling around for them in between the seat cushions, or by visually locating them by finding the button or tag with the LATCH symbol on it. Premium LATCH connectors have push on/push off buttons that are usually red, as opposed to the steel clips on standard LATCH connectors. The standard connectors are difficult to install (and even harder to uninstall) should you ever plan on doing so. 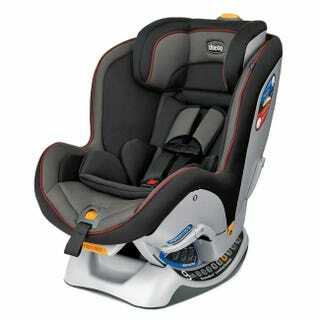 New regulations put into effect starting in February of 2014 state that once your child’s weight plus the weight of your seat exceeds 65 pounds, you must discontinue using LATCH. All seats can be installed with either LATCH or a seat belt (but not both, with two exceptions), and with a tether if required. When done correctly, these are equally safe. Every seat we tested had LATCH connectors in addition to the tether, which is designed to stabilize a seat in a crash. All Diono and Peg Perego convertible seats even allow for rear-facing tethering when a suitable position can be found in the car—an added safety feature. We read through the reviews on popular websites and narrowed down our list of car seats based on the above criteria, as well as what real parents actually said. We took the top five candidates out into the real world and tested them in three vehicles: a large SUV (Lexus RX350), a midsize sedan (Audi A5), and a compact car (Honda Fit). This gave us a good impression of how these seats would fit in the majority of cars. We read each manual, making sure that they were comprehensible and then installed the seats both rear-facing and forward-facing, using the seat belt method and then the car’s LATCH system. We made sure that none of the models we were using had been recalled, seeing as there were over 7 million seats recalled in 2014. Those recalls involved buckles that were difficult to open or close due to debris getting inside of them. This could be life threatening should you be in a collision and need to get your child out of the car or need to secure them into their seat. Our top five candidates all had high rear-facing weight limits (usually exceeding 40 pounds) and a decent amount of seating space for those children, making them good choices for extended rear-facing use. We used a 10-pound infant mannequin and a living, breathing, 39-pound five year old to assess the usability of the harness systems and see how each child fit into the seat. After numerous test fits, we’re confident that the Chicco Nextfit 65 is the best convertible car seat out there, thanks to its quick and easy installation and a generous amount of interior seating room. It even fit our five-year-old tester when rear-facing. The Chicco Nextfit 65 fits into smaller back seats, plus it offers a lot of room for growing toddlers. The headrest is “no-rethread,” meaning when you move it up as baby grows, the harness height adjusts simultaneously. You’ll never have to rethread your harness. This feature was a coup in a crowded field of car seats. Our pick fits children rear-facing from five to 40 pounds and forward-facing children from 22 to 65 pounds, or 49 inches tall. Taller children can stay rear-facing until their head is within one inch of the top of the fully extended headrest, affording them a lot of space to grow. When installing the seat, there are nine different recline positions. This enables the installer to achieve the proper angle (especially when rear-facing) without resorting to using pool noodles or rolled-up towels like some parents have to do. When using LATCH, the seat is enabled with premium connectors and utilizes Chicco’s Super Cinch technology. Basically, this means that when you go to install your seat, you’ll pull down on the Super Cinch side, instead of up. In doing so, the seat’s LATCH belt will add tension, in addition to the leverage you’re exerting, making it faster and easier to install the seat tightly. How tight should it be? I asked Cora Speck, a certified CPST and instructor as well as the Trauma Injury Prevention and Research Coordinator at The Queen’s Medical Center in Hawaii, and she advised that “the seat should move no more than one inch, side-to-side, at the belt pathway, when you try to move the seat with your non-dominant hand.” If you need to install your car seat with the seatbelt, the Chicco Nextfit 65 comes with dedicated lock-offs, or clasps that hold the seat belt and secure it in the event of a crash. Even though the Chicco Nextfit 65 is an excellent and long-lasting convertible seat, it has deep walls that, unfortunately, retain heat on a summer day. This an issue with most car seats on the market. Thankfully, the fabric Chicco uses around baby’s head and shoulders is much lighter and doesn’t get as hot as some of the more plasticky materials we saw on other models. The Nextfit is easy to clean and maintain, with a removable seat cover. There are two elastic bands to undo to remove the headrest, and the seat cover comes off after unhooking two velcro straps on the inside of the shell. The fabric is machine washable on a delicate cycle and can be line dried. The fabrics are also easy to spot-treat and they cleaned up well in our time with the seat. The buckle is removable and can be cleaned with warm, soapy water. For the money, the Chicco Nextfit 65 is a great value at $300 but for those interested in upgrading to a nicer, zip-off fabric, Chicco has released the Chicco Nextfit Zip, for $350. This offers a completely zip-on zip-off seat cushion for easy cleaning. I’d stick with the original version, as the technical details and ease of use have not changed enough to merit the price increase. Another thing, and maybe this was an oversight: A tot could be enticed to constantly play with the zipper if it was near his feet on a long road trip, which wouldn’t be ideal. Even though the Chicco Nextfit 65 commands a premium price, it offers features that aren’t available on similarly-priced models: You’re getting a no-rethread harness, one of the easiest forward or rear-facing installations, premium fabrics, and a space-saving design that will fit into most vehicles. On Amazon.com, the Chicco Nextfit 65 has a rating of 4.3 stars over 473 reviews. A recent post said it was “so easy to install;” at the time of writing, 51 customers made similar statements. Recently, Consumer Reports added new convertible car seat ratings and not only recommended our choice but also gave it the highest score. For those who want the newest technology and the best fabrics, the Clek Foonf is the logical choice. Clek is at the forefront of a new era of occupant safety, being one of the only manufacturers to share their crash test data. The seat performs exceptionally well in those tests and is very easy to install due to the seat’s heavier overall weight. Little to no added force is required when tightening the seat, and even our seat belt installations were done in a flash. The seat utilizes Rigid LATCH for forward facing installations, and can be coupled with the seat belt and tether. The star feature on the seat is the REACT system, which stands for Rapid Energy Absorbing Crumple Technology. This is an aluminum honeycomb block that compresses in a crash, reducing the amount of energy that’s transferred to the seat’s occupant. Other features include an anti-rebound bar, a steel-and-magnesium substructure and GREENGUARD Select certified fabrics that clean up easily. It is expensive, starting at $449, but it offers new technology not found on the majority of products currently available. It’s also 17 inches wide at the widest part of the seat and only 13 inches wide at the base, making it a great fit for parents who need more than one car seat in the car. For those parents who want a less expensive alternative, or who want a second seat for their other car, the Evenflo Symphony LX does a good job at only $140. The Symphony fits newborns well and has a rear-facing range of five to 40 pounds and 0 to 37 inches. Forward-facing, the seat fits children 22 to 65 pounds and up to 50 inches tall. The seat also functions as a belt-positioning booster for kids who are at least four years old and who are between 40 and 110 pounds heavy and 43.3 to 57 inches tall. This seat stays useful: it doesn’t take up much room front to back when rear-facing and will fit kids for several years in different-but-simple configurations. Even with the promise of a 3-in-1 design that can be used from birth to booster, there are some inherent design disadvantages, as compared to normal convertible seats. For one, you won’t be able to keep a child rear-facing as long as in the other seats that we tested. The seating area is on the smaller side and wouldn’t be the best choice for those who want to have rear-facing children past age 2. The seat is also fairly wide, measuring 21 inches at the widest point. This makes it hard to sit next to; it’s almost impossible to install another seat next to it. Lastly, the seat over-promises on the range and specifications that it offers. Due to the large headwings, it’s not uncommon to see kids move out of this seat before the maximum height or weight limits once in the booster mode. The headwings can interfere with the child’s shoulders and limit the amount of room they have in the seat. There’s no lockoff for seatbelt installations and there are also no strap covers to protect your child’s face and neck. All that said, it’s an impressive seat that does offer many good features that are not usually found in this price range. Another seat that receives high praise for its ease-of-use is the Britax Boulevard Clicktight. This seat offers a new installation technology that Britax has dubbed—you guessed it—“Clicktight.” This was introduced to make installation easier when using a seat belt, something that more parents are having to do sooner, given the new LATCH Regulations. To install, position the car seat in the seating position of your choice, choose your recline angle (with the aid of a marble level) and press on the Clicktight dimple. Once engaged, put your seat belt through the color-coded belt path and press the seat down. An audible click can be heard when the seat is locked into place, and you’re done! While this technology isn’t new (it’s been on Britax’s Frontier 90 Clicktight for about a year) it is a unique feature found only on Britax seats. The two knocks on this seat were the weight limitations (around 30 pounds) and the space it took up in the car. The added width and length made us move our front seats up about an inch more than we had to with our pick, and it was definitely encroaching on our elbow room. That said the seat has been well-received with a 4.3 rating with 174 reviews on Amazon in the short time since it was released. Earlier we mentioned that many parents are now seeking out a convertible seat for their newborns. Many seats say that they’ll fit a newborn from day one, but how many do this well? Here are two seats that truly fit a newborn, even as small as four pounds. No joke. The optional infant insert for the Clek is called the Infant Thingy. They also make the Mat Thingy (a rubber car seat mat) and the Drink Thingy (a cup holder). The infant thingy is designed for babies starting at five pounds and up to 22 pounds or 19 to 33 inches tall. The insert fits inside of the Clek, using the existing strap system to secure the child. Due to the fit, you’ll remove the Clek’s headrest, which should also save you some space and add legroom to your front seat. The Infant Thingy runs $70, and fits in all models of the Fllo and Foonf. The original Maxi Cosi Pria 70 starts out at a nine pound minimum, but for those who want to use the seat for a newborn, this edition of the seat with the TinyFit insert is a must-have. The TinyFit insert fits your child from four to 22 pounds, with three specific harness slot positions on the insert’s shell. The buckle slots start as low as five inches, so even the smallest newborns who are ready to head home will fit just fine. Britax Marathon G4 $220—It comes in at a lower price but lacks the better features of the brand’s Pavilion and Boulevard models. Diono Rainier $300—The Rainier is expensive and takes up a lot of space when rear-facing. Awkward fit for smaller babies and a more difficult-than-average seat belt installation. Graco Extend2Fit $200—This model has an awkward harness system. Due to the wide range of use, the fit to child is difficult. Many complaints of the harness system being difficult to tighten/loosen. Graco MyRide 65 $110—This popular model has old-school LATCH connectors and a hard-to-use harness system, and the maximum height is 45 inches. Maxi Cosi Pria 85 $300—This is a higher capacity model of the Pria 70. The infant position takes up a lot of room when rear-facing, and the wider seat is hard to sit next to. Also, there are no lock-offs for seatbelt installations. Peg Perego Primo Viaggio Convertible $349—It has a rather small seating area, making for less space when rear-facing. This seat offers premium fabrics, but may require the use of a locking clip when installing, making it much more difficult to do. Recaro Performance Rally $225—While there are significant improvements from the older Performance Ride model, the seat sits slightly higher in the car, and the extended cup holder design makes it difficult to get your child into and out of the seat, especially in a small car. Recaro Performance Ride $225—This one offers no rear-facing lock-offs, and its tall shell makes fitting this rear-facing difficult in smaller vehicles. Safety 1st Complete Air 65 $200—We dismissed this one because of bulky design, no lock-offs, and a large head ring that limits peripheral vision. You’ll get a one year warranty on most seats, including the Chicco Nextfit 65. Their customer service is available to help you with your product (including usage tips) five days a week. Their online store even has replacement parts, in case you’re in need of a new buckle or a shoulder strap cover. With all of the accessories that are available at baby super stores, many parents feel the need to add cushions and mirrors to their seats. Every car seat we looked at advised against putting third party accessories onto their seats, since they’re not used during testing and can affect the seat’s performance. These include but are not limited to: mirrors, hanging toys, teethers, and trays. Car seat expert Cora Speck told us “Those cute but heavy mirrors that you put over your vehicle seat, so that you can take your eyes off the road to look in your rear-view mirror, to look in this mirror, to look at your crying baby, and get into a crash? Skip it! The best thing you can do for your baby is be an attentive driver.” Any of those items in the car can become a projectile in a collision. Limiting the amount of devices and toys in the backseat can save lives and prevent injury to the vehicle’s occupants. If you’re buying an infant car seat first, you’ll want to keep them in there as long as possible. Graduating early, especially turning them forward-facing at the minimum age and weight requirements, can put your child at a much greater risk of injury than staying rear-facing. The best car seat is one that fits your child and your vehicle that you can install correctly every time. With the Chicco Nextfit 65, you can accomplish all this, and it even allows for extended rear-facing. We had no trouble installing it in different vehicles using different methods of installation, and it fit our two testers. The price is great, with this year’s model coming in at $300, and the seat will grow with your child for several years to come. 24. Cora Speck, Interview, The Queen’s Medical Center, August 1st, 2014.